Everyone knows that American shale oil production is booming. The mainstream media has been all over the story. They should be. After all, what the entrepreneurial U.S. oil and gas industry has done to free oil long-trapped in shale rocks has been incredible. What not so many people know is that the shale producers are pumping the WRONG KIND of oil. U.S. refineries are desperately short of a different kind of oil than what the shale producers are delivering. This is the untold story of the oil market — one that we can take advantage of as investors. Turn the clock back 15 years and you would see that shale oil production was non-existent. At that time (and for decades prior), everyone believed that U.S. oil production was in terminal decline. We knew that there was lots of oil trapped in shale rocks, but it was uneconomical to produce. As a result, U.S. Gulf Coast refineries were built to process the only oil that they expected would be available to them — heavy oil imported from Canada, Venezuela and the Middle East. Heavy oil is a dense type of crude that doesn’t flow easily — picture molasses. Heavy oil also contains impurities like carbon and waxes and therefore is more expensive to refine into finished products. Because it is more expensive to refine, it is less valuable. 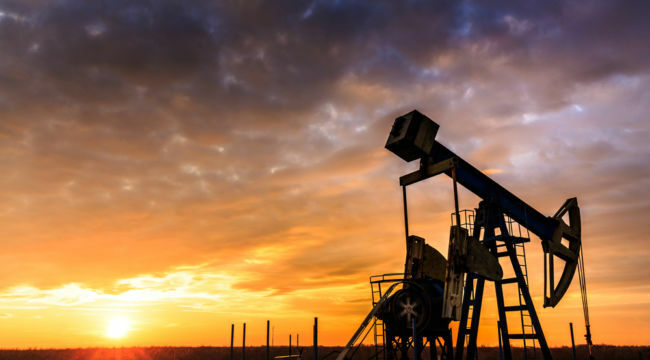 Heavy oil usually sells at a significant discount to a light oil blend like West Texas Intermediate (WTI), which is the oil price that is commonly referred to in the financial media. The shale oil revolution created a surge in production, but more specifically a surge in light oil production. This is not the type of oil that most of the multi-billion dollar Gulf Coast refineries were built to process. 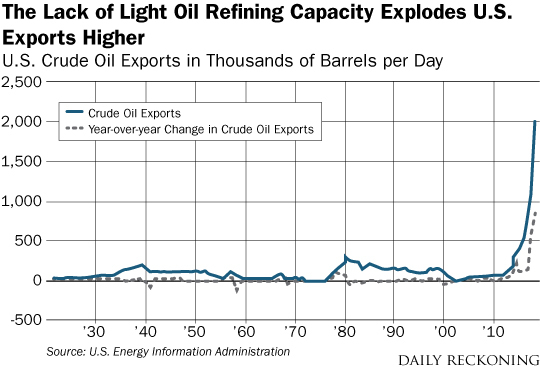 This lack of light oil refining capacity on the Gulf Coast is why we are seeing American oil exports explode higher. We can’t refine all of the light oil being produced from shale here in America, so we have to send it abroad where there is still refining capacity for it. Don’t let these exploding oil exports make you think that we have too much oil here in the United States. In fact, the U.S. is still a big net importer of oil. We are only exporting light oil specifically because we don’t have enough refining capacity to process this specific type of oil. We are still importing the heavy oil that much of our refinery complex was built to process. And currently these refineries are having a hard time getting enough of that heavy crude. Collapsing Venezuelan production, a lack of oil pipelines out of Canada, and production cuts by Saudi Arabia have put a big dent in the supply of heavy oil. With heavy oil demand from our refineries strong and supplies of heavy oil tight, the usual pricing result has arrived. Heavy oil prices are exceptionally strong. We have been following this heavy oil trade for months here at The Daily Edge. In December we predicted a big rebound for Canadian heavy oil prices. That rebound has transpired. Last month we noted how Warren Buffett also pounced on the trade. Now, here we are today and the rest of the market is still very much behind on this opportunity. Baytex Energy (BTE) is a dirt cheap Canadian heavy oil producer. When I say dirt cheap I really mean it. With current oil prices, Baytex is going to generate roughly $300 million of free cash flow in 2019. When I say free cash flow I’m talking about cash flow in excess of all spending necessary to run the business. Cash that can be used to repay debt, pay dividends, or invest in growth. Realistically, Baytex shares could double from here and still not be considered expensive. Eventually the market is going to catch on the great pricing Baytex is receiving for its heavy oil and this dirt cheap valuation is going to get corrected.